All transactions are safe and secure with a reliable history in online purchasing behind each of our associates. 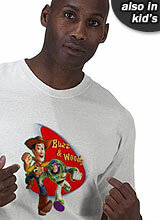 Buy the Buzz and Woody t-shirt to own Toy Story clothing and merchandise. When you think of best friends, who do you think of? You might picture some of the classic friendships like Lucy and Ethel, Bert and Ernie, or Mario and Luigi, but I think of a more recent pair, Woody and Buzz Lightyear. Although their relationship started out rocky when Buzz Lightyear swooped in and took the attention away from Woody, a variety of risky adventures have made these two inseparable. It took a lot for both of them to survive the grips of evil neighbor Sid Phillips. Celebrate the dynamic duo with one of these Toy Story t-shirts that any child (or adult) would be happy to wear. In addition to the Buzz and Woody tee above, browse the Toy Story Clothing Gallery for more apparel like men's and women's clothes, kids shirts or hoodies.